Finally got these two sets out at my Main Shop location and I'll be rolling them out to my satellites soon. These sets were inspired by Avril and Taylor for a bit of punky and sweet. I named them Sugar and Spice. This is my first time using a lot of hand morphs with the poses, I normally avoid it because SL isn't reliable with hand morphs - but I think these came out okay. I would recommend using an emoter HUD with them for added fun! 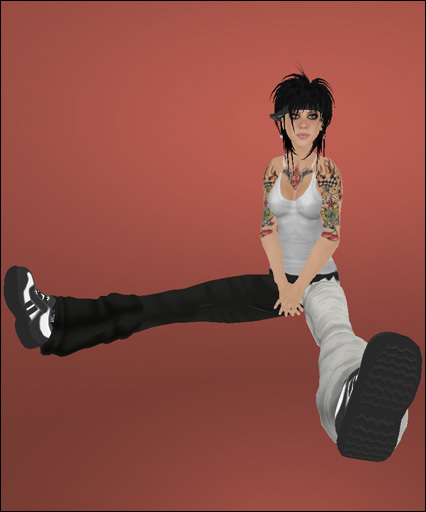 If you haven't yet you should join my flickr group, see what others are doing with [LAP] poses, get sneak peeks of new poses and participate in fun bi-monthly contests! 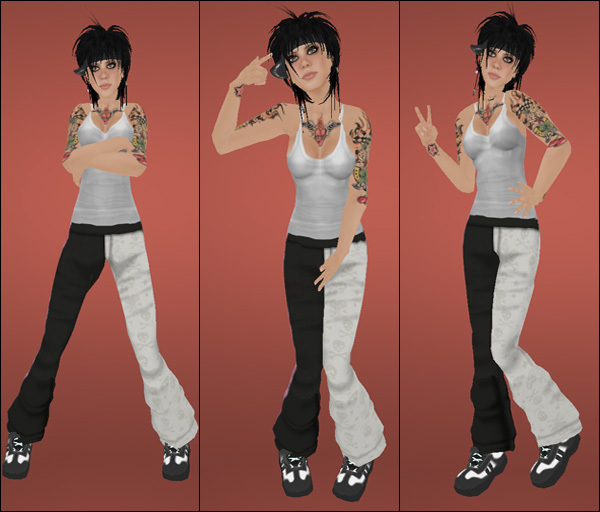 Spice Set: Top - MichaMi, Pants & hair - amerie's Naughty, Shoes - Sculpties Up In Here, Skin - Gala, Tattoos - artilleri. Sugar Set: Top & Gloves - ZX, Skirt & hair & leggings - amerie's Naughty, Shoes - Sculpties Up in Here, Skin - Gala. 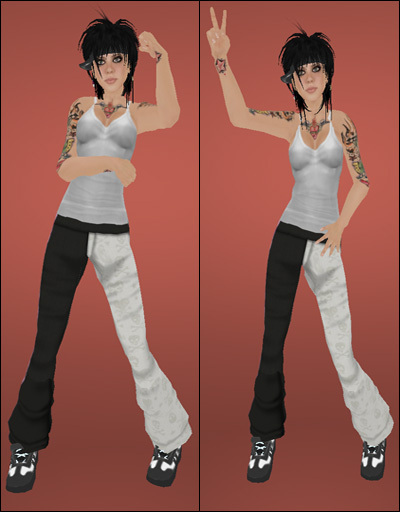 Some credits since I'm horrible about not mentioning them: Top - MichaMi, Pants & hair - amerie's Naughty, Shoes - Sculpties Up In Here, Skin - Gala, Tattoos - artilleri. Important Shop Info - Pose Replacements! If you have purchased pose sets from me between June 20th and July 17th, please read on! In my sets I included two versions of my poses. One set is more AO-friendly, but the ones labeled PR4 are the ones I am replacing at your request. I goofed up and left the heads loose on them, and the photographers and bloggers out there have been heard. :p I reupped them ...once again...and now the PR4 (priority level 4) poses are now completely static. No loose heads. Hooray! You will find your transaction details by looking on the day, using the dropdown, that you purchased the items on and highlight by running your mouse over the transaction, then if using windows CTRL C, then CTRL V into a notecard in world, then send to Dove Swanson. Sorry for the hassle everyone, and yes, I have lots of newness coming to you guys very soon, as well as some freeness for my group (you should join it if you're not in it!). Thanks! FIXED!!!! A very helpful forum user was able to give me a tip. Apparently the newer models come with bundled (forced) security software. So, if you come across this problem, make sure to uninstall the 'edata security' software. That's all I did and it fixed it. I'm only bumping this to make sure people know and just incase anyone else has this problem you guys will know what to tell them. Thank you everyone! I know this is poor form to post something non-fashion related on the feed, and doing so with my shop blog. :o Whoops. But this is important to me. Some of you might know that I've been struggling with a dying computer for weeks now. I finally decided to call it quits with the old beast and so I got a new computer wednesday. It's lovely, it works wonderfully. I didn't actually try uploading anything until Sunday, and that's when I ran into a problem. For some reason I can't upload - at all. I have no upload dialog menu. I crash if I try to force it to find a file. I crash crash crash. I've done everything I can think of - uninstalled, reinstalled, different accounts, different viewers. Today a friend pointed me in the direction of a JIRA that is my problem exactly. Apparently it's a new model Acer issue, as that's what my computer is too. If any of you want to take a look at the symptoms in the JIRA comments and give me ideas or suggestions - I'd love that also. But if you could just take a moment to go there and simply vote on the issue, I'd appreciate that muchly. This is rather crucial...it might not seem like much, but without the ability to upload - LAP comes to a grinding halt. I'm going to steal a computer from my mother or brother to try and use for uploading in the meantime, but that will be such a tedious process I can probably assure you that I won't accomplish much at all. So, for those of you who care about this at all, and my sanity, please vote! [LAP] @ Starlust Motel - July 4th FUN! My satellite shop at the Starlust Motel will have one pose set inside the shop marked down to 50% and in front of the motel, on the picnic tables out there, you will find a totally free pose set - plus lots of other fun freebies from Starlust designers. My holiday deals run out tonight at midnight, so hurry while the gettin is good! Hope to see you guys over there, be safe and have a happy 4th!! [LAP] @ Retrology! Sim Wide Fun! The 50% off sale at my main store location is over, you probably didn't even know I had one unless you were in my update group (shoulda, woulda, coulda! )...but, now you get a second chance to grab some goodies from [LAP]! Hope to see you guys over there, enjoy yourselves, happy canada day and independence day!